What does a Toastmaster do? This is a question I get asked at nearly every Wedding Fair I attend. If people have not seen a Professional Toastmaster in action they assume he will just make formal announcements. This couldn’t be further from the truth.The Toastmasters role is to be the bride and grooms eyes and ears, turning all their plans for the big day into reality. 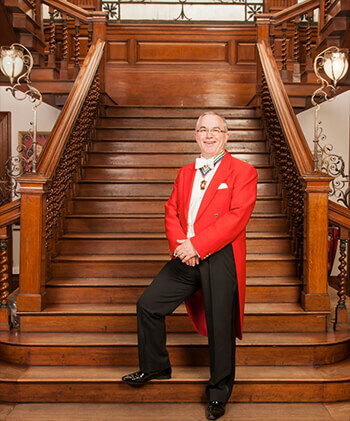 The Toastmaster is the figure head, dressed in his formal attire,who works together with all other suppliers and agencies,to turn your event into an occasion. It is the job of the Professional Toastmaster to make your day run, smoothly,calmly, stress free, and enjoyable for you and your guests.In addition the Toastmaster can also assist those who have speeches to make during the day on the protocol and etiquette of public speaking at a wedding. I also like to share my experience by giving tips and advice on how best to deliver a speech. When would a Bride and Groom meet the Toastmaster? If a bride and groom decide to hire a Toastmaster it’s always a good idea that they don’t wait until the big day to be introduced. Personally I like to meet the bride and groom beforehand as it’s a good opportunity to get together in a relaxed environment and discuss the wedding day in detail. What service does the Toastmaster perform on the day? A Toastmaster should always be prepared to be flexible, tailoring their service to what the bride and groom want. That said all Toastmasters vary in the services they offer.